Gate2018online.IN: ISRO 2017 Electrical Recruitment Asked Questions Paper with Answer. ISRO Recruitment 2017 for Scientist/Engineer `SC’(Group ‘A’ Gazetted Post). Exam date of ISRO 2017 is 07 may 2017. Answer Key is now uploaded in ISRO official website and also questions paper and answer key is Available at our website. 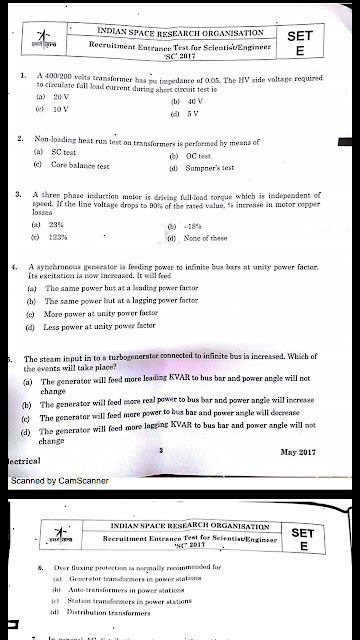 Previous Year asked Electrical Questions Paper in PDF has been uploaded @ www.gate2018online.in i.e. at our website. ISRO 2017 Electrical Recruitment Asked Questions Paper with Answer read all questions it helps for another exam. ISRO full form name is Indian Space Research Organisation. It is the space agency of the Government of India. The headquartered of ISRO is in the city of Bangalore. Electrical and Electronics Engineering in First Class with a minimum of 65% marks. registration mode and registration will start from 22.02.2017 and the last date is 14.03.2017.
the schedule and venue of which will be notified. The written test is only a first level screening and written test score will not be considered for the final selection process. Final selection will be based on the Interview and those who secure minimum 60% marks in the interview willbe eligible for consideration for empanelment in the selection panel, in the order of merit. 11.05.2017. The candidates may raise objections with valid justifications, if any, within 5 days (i.e. other modes will not be considered under any circumstances. future reference. E-mail ID of the applicant will have to be given in the application compulsorily. We will soon update ISRO electrical 2015, 2014 and 2013 Asked Questions Paper.